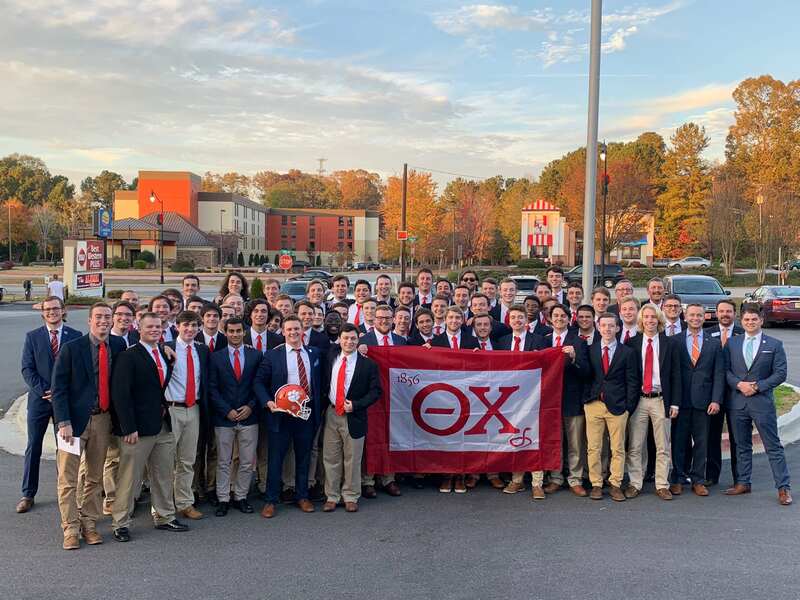 Clemson, SC – On November 18, 2018, the Eta Alpha Chapter at Clemson University was officially reinstalled. This is the Fraternity’s fourth active chapter in the state of South Carolina. The return to Eta Alpha began with the work of Chief Operating Officer Ray Vanlanot and Director of Recruitment and Expansion Taylor Dahlem, who traveled to campus to present to the university on the prospect of Theta Chi returning. After securing a bid to return, Field Executives Shaun Hamlin and Blake Whitley arrived on campus in August 2017 to begin recruitment efforts. In a little over two months, 34 men had signed bids with Theta Chi. On November 5, 2017, Eta Alpha was officially recolonized in the Hendrix Student Center on campus. Upon leaving campus, the Field Executives instructed the colony members that momentum was in their favor and that they needed to capitalize on their progress. The colony grew to 63 members through vigorous recruitment efforts that included strong involvement throughout Clemson’s campus. Members were part of a myriad of Clemson student and community organizations, including: Academic Team Club, Agribusiness Association, Air Force ROTC, All-In AutoCross, Alpha Lambda Delta Honor Society, American Medical Student Association, Army ROTC, Association of Information Systems, Big Man on Campus, Catholic Student Association, Chess Club, Chocolate Milk Club, Club Baseball, Club Lacrosse, Club Ultimate, Criminal Justice Club, CU Cyber, Economics Club, Engineers Without Borders, Fellowship of Christian Athletes, Fisheries Club, Fly Fishing Club, Forestry Club, IPTAY Collegiate Club, Materials Advantage, Microbiology Club, National Society of Leadership and Success, Off-Road Club, PEER, Psychology Club, Recreational Golf Club, Residence Hall Association, Rocket Club, Running Club, Russian Club, Sailing Club, Scabbard and Blade Honor Society, Spikeball Club, Tiger Ties, Turning Point USA, UCBS, Varsity Rugby, Watersports Club, Weightlifting Club, and Young Americans for Freedom. As a colony, the members participated in numerous campus events including Clemson Miracle Dance Marathon, intramurals, and Habitat for Humanity. They also hosted a seminar on sexual assault prevention and organized events to benefit the USO and Toys for Tots. Based on their progress, the colony members submitted a petition to the Grand Chapter, and on November 18, 2018, Eta Alpha Chapter at Clemson University was officially reinstalled. The Reinstallation Ceremony was held at the Hendrix Student Center with past International President Joseph Couch presiding. Others in attendance included Past Grand Chapter member and Past President of The Foundation Chapter Warren Hoffman, Chief Operating Officer Ray Vanlanot, Director of Recruitment and Expansion Taylor Dahlem, Director of Education Shaun Hamlin, Field Executives Colin Ogle and Blake Whitley, and brothers from Beta Psi/Presbyterian, Gamma Rho/Florida State, Zeta Beta/Adrian, Zeta Xi/UC-Davis, Eta Alpha/Clemson, Eta Iota/Newberry, and Iota Phi/South Carolina. The 63 Rechartering Members are: Iain Allingham (2021), Eddie Bailey (2022), CJ Bakle (2021), Zach Balogh (2021), Patrick Bell (2021), Chase Bender (2021), Sean Borbely (2021), Nicholas Bunker (2021), Jack Byrne (2021), Sam Coleman (2021), Owen Connors (2020), Garrett Davidson (2022), Curtis DeBell (2021), Anthony DePietto (2021), Blake Disher (2020), Shane Dunlavey (2021), Andrew Eubanks (2021), Brad Farrell (2020), Zach Folmar (2022), Dane Fortune (2020), Sam Foster (2021), Christian Fratini (2021), Matthew Garberina (2020), Travis Garceau (2021), Jake Genovere (2021), Trey Gibson (2020), Josh Golliher (2021), Judson Gore (2021), Taylor Heath (2021), Justin Hollett (2021), Erik Jones (2019), Ryan Joyce (2021), Seth Kantz (2021), Will Kirkpatrick (2021), Ben Krauss (2021), Spalding Latham (2021), Alex Loayza (2020), Brent McIntire (2021), Stanton McKay (2021), Emmett McLaughlin (2021), James Munford (2021), Zach Nill (2020), Alex North (2021), Ethan Norton (2021), Andrew Patterson (2021), Josh Rojugbokan (2022), Eric Rotteveel (2021), Hayden Schmidt (2021), Tony Schmitt (2021), Jake Schnack (2021), Spencer Shain (2020), Zac Smith (2021), Connor Sosebee (2020), T.O. Sosebee (2022), Ethan Tedford (2020), Jake Tester (2021), Dan Thomas (2021), Kieran Tilford (2020), Jake Vastine (2021), Jason White (2021), Noah Wilson (2021), Cameron Wingertz (2021), and Jonathan Yates (2020). One of the new brothers is a legacy: Blake Disher, the son of Scott Disher (Eta Alpha/Clemson 1984). Following the Reinstallation Ceremony, a banquet was held at the Best Western Plus University Inn in Clemson. Additional guests included Director of Fraternity and Sorority Life Gary Wiser, Assistant Director of Fraternity and Sorority Life Joe Strickland, and family members and girlfriends of the new chapter brothers. Speakers at the banquet included Joseph Couch, Ray Vanlanot, Shaun Hamlin, Blake Whitley, Chapter President Jason White, and Chapter Adviser Eric DeWerth, who was presented with the David E. Devol Award. During the banquet, the chapter was presented with the original charter from 1970 by Charter Member Forrest Henriksen (1971). As a parting thank you, Eta Alpha Chapter presented members of the International Headquarters staff with Clemson memorabilia. For their hard work in getting the group started, Shaun Hamlin and Blake Whitley were presented with full size replicas of the Clemson Tigers football helmet. "I am so proud of all of our members for all we have accomplished to be reinstalled on Clemson’s campus,” stated Chapter President Jason White. “I can’t wait to see what this chapter will do in the future." Congratulations to our new brothers of Eta Alpha Chapter! Congratulatory notes may be sent via email to Chapter President Jason White. You can follow the progress of Eta Alpha Chapter on Facebook, Twitter, and Instagram. Clemson University, founded in 1889, is a science and engineering-oriented college dedicated to teaching, research and service. The university has been ranked as the 24th best national public university by U.S. News & World Report. They are a member of the Atlantic Coast Conference. Located along the western boarder of South Carolina, the campus sits a couple of hours Northwest of South Carolina’s capital of Columbia and just over two hours Northeast of Atlanta, GA. Founded in 1856, Theta Chi Fraternity is a men’s collegiate fraternity with more than 191,000 initiated members and has established 240 chapters. Leadership development, personal development, and service to alma mater are fundamental to Theta Chi Fraternity’s mission.